Spending a week in Israel earlier this month I kept my eyes open to the way Israelis use technology. Even on my first time in Israel over 18 years ago I noticed that Israelis thirsted for the latest tech gadgets. Being a country that struggled with telecommunications early on in its existence primed Israel for a telecom revolution. In the first decades of statehood, stories persisted about families who waited years just to get a telephone in their own home. So when mobile communications took off in the middle of the 1990s, Israelis were eager to adopt the new technology. One thing I noticed during my recent visit was that the Apple iPhone is much less common in Israel than it is in North America. I also got the sense that Israelis prefer the GPS app Waze over other GPS services. That could be in part due to Apple’s decision not to link Jerusalem as the capital of Israel in its Maps application or World Clock on its new operating system. Back in September when Apple CEO Tim Cook admitted that Apple's mobile Maps application was inaccurate and had many flaws (including the Jerusalem situation), he advised users of OS5 to download alternative navigation apps including Waze which was designed by Waze Ltd., an Israeli company. The geographical data that appears on Flickr and Yahoo! Maps comes from a third party map provider and we are working with them to understand and improve the gap in geographic coverage that has been reported. Yahoo! always wants to ensure the best possible product experience for our users, and this falls short of those expectations. We are continually working to source and roll out coverage where there is room to provide greater mapping details. In particular, we hope and expect that you will see improved maps coverage of Israel shortly. The next day Flickr debuted a map that rendered Jerusalem as a normal city with its streets and landmarks returned to the way it was. There was no explanation for the error. While the situation between the Palestinians and the Israelis is indeed a complicated one, full of nuance, I think most would agree that these social networking sites are not the proper forums to play out the political situation. As far back as March 2008 Israeli settlers were fighting with Facebook to list their home city as part of Israel rather than Palestine. Ultimately, users in such settlements as Ma'aleh Adumim and Ariel were able to switch their hometowns back to Israel. However it seems like Facebook is once again taking it upon itself to determine which country users live in. Facebook groups have popped up urging Facebook to remain neutral in this political matter and not unilaterally list Israelis as living in Palestine. As Ben-David explained, "We are living in a new reality where our sense of history is being molded – crafted, even – through social media. News outlets are barely fast enough to keep up with the speed by which social media spreads information. Hence it is social media that people today turn to for their news. And their facts. Today’s information from social media will be tomorrow’s history. 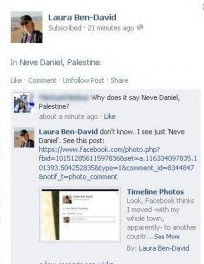 In other words, if Facebook says it’s Palestine, it must be true. Even though it isn’t."